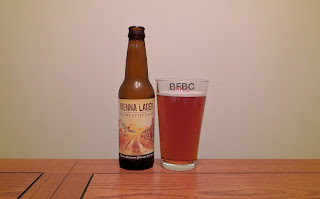 I don't know if I've had a Vienna-style lager before. I can't seem to find one in the handy search box on this blog. 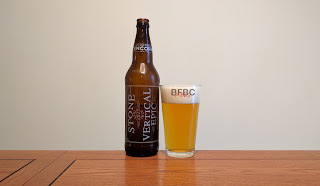 So, with the Devil's Backbone having hovered around the "Just waiting to break out and have a giant hit" section of the blog, I figured I would scoop this up and try it out. The beer is a fairly clear kind of amber-orange with what eventually amounts to almost no head. Lacing is something this beer doesn't have anything to do with. Instead, It is happy with a gentle ring of bubbles around the top, and that's it. The aroma is very fresh bread; it's like walking into a subway restaurant kind of fresh bread. It's an interesting smell, that's for sure. I picked up two cold Tennessee Brew Works beers the last time I hit the store. The first beer was, admittedly, not that great. That doesn't mean that this one will be as bad. I mean, these guys (gender neutral, as I have no special insight into their brewery) clearly got enough momentum to start a brewery and even distribute the beer (which is one aspect that CSB had and lost). Let's bring the awesome! 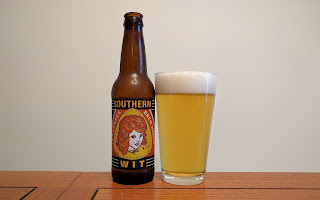 Another sticky head tops this pale yellow beer with a very grainy and lemony aroma that seems almost to be just this side of skunked. I'd have checked the date this was brewed, but they didn't decide to include the brew date on the bottle at all. It's okay, because it seems to just be flirting with the possibility of skunk, and it might just be me for all I know. Terrapin's wares have been up and down, but they are generally right in the middle. As a consequence, I don't actually have very high hopes for an outstanding beer, but I also expect not to have undrinkable swill. I don't generally aim for the middle-of-the-pack beers, and I hope they don't, either. I want a very good beer... might this be it? It's a yellow beer with a slight orange glow that has a nice head that leaves a lot of lacing, and I, as you probably know, love that. 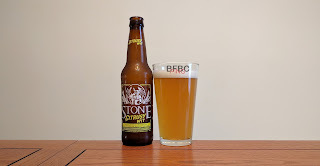 The aroma is expectedly citrus hops with a touch of spices. I can't smell much more, as the aroma is really gentle. I really like California IPAs, and I'm going to love this, I'm sure. The Stone guys are good. 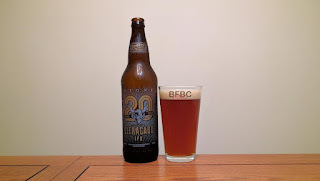 This is an anniversary ale, and it was released in August 2016. It is currently October 2016 (at the time of writing), so this should definitely be fresh enough (assuming this is one of the beers that is best fresh). 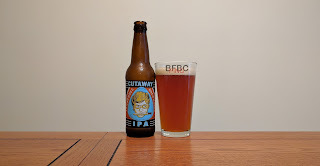 I buy beer hoping it is good - there's no reason to buy beer that you know isn't good - and that's why I tried the best that Budweiser had to offer, but I haven't gone full Bud. I could probably go a lot of ways with the description of this color. Is it a reddish brown? A dark amber? Chestnut? Dirty mahogany? You decide, as I have too many descriptions to pick from. The head is somewhat sticky, so it definitely leaves some lacing... okay, it's actually a really nice amount of lacing. It also leaves a fairly thick cap on top of the beer. The aroma is floral and citrus hanging out together with kind of a caramel malt with it. 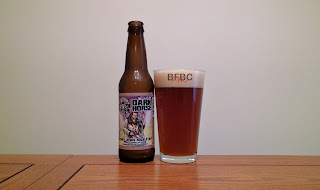 My second beer from Dark Horse, and I have not made my mind up about them. They have these ludicrous drawings on their labels that look like rejected Grateful Dead covers, and their beer names are from the fever dreams of people on strange substances that might get smoked or ingested at one of those concerts. The hazy, straw-gold beer supports a head that refuses to leave lacing no matter how much I beg. Instead, it boils away to a thin veneer on top of the beer, and it lets the aroma of heavy citrus and grains permeate it just fine. I've always said that if beer makers want citrus added to their beer, they should add it at the brew-house, and it looks (or rather smells) like these guys have done that, and I applaud them even before tasting it. 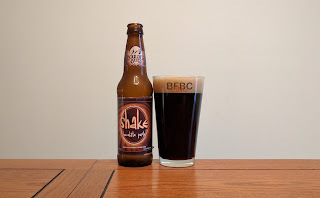 This is a beer that Jeremy from City Sliquors decided to "donate to the cause" even though he hadn't had a chance to try it himself, and I much appreciate his trust in me to review the beer on his behalf. For starters, this looks too much like a hipster beer from the get-go with its off-the-wall name and strange ingredients. 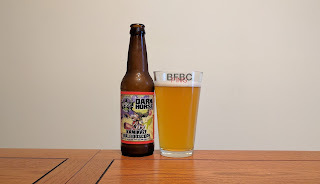 Add to that the fact that "Dark Horse" is the name of a comic book company I remember fondly from my youth, and you have a beer that pulls me in two directions. 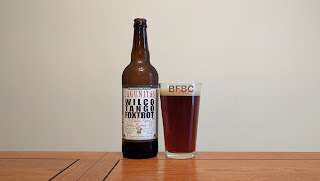 No, I will not write yet another love letter to Lagunitas as an intro. 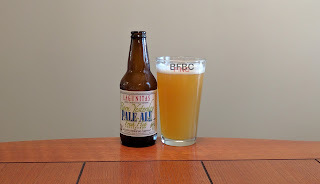 You all know what I think about the amazing non-craft brewer from Petaluma (and also Chicago, for some reason) so I won't go on about it. Instead, I'll comment that the beer today claims to be a "jobless recovery ale." I don't know what it means, but these guys have an odd sense of humor and they don't really understand that a label is probably not the best way to get a complete thought across. The patchy head doesn't leave the lacing of its brothers, but it leaves some, and that's a step in the right direction. The beer underneath is a very deep red with the sweet malt and floral hops sending their scent straight up through the bubbles and into my nose, and my nose is happy about the whole thing.